The Chinook salmon is the largest species in the Pacific salmon family. Other commonly used names for the species include king salmon, spring salmon and Tyee salmon. 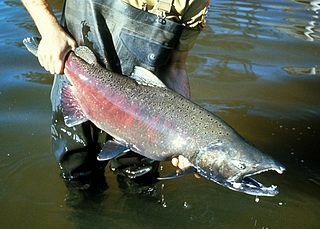 Chinook are native to the North Pacific Ocean and the river systems of western North America ranging from California to Alaska. A large Chinook is a prized and sought-after catch for a sporting angler. The flesh of the salmon is also highly valued for its dietary nutritional content, which includes high levels of important omega-3 fatty acids. The Chinook salmon has black pigment in its mouth, speckled spots on its back and black spots on its tail. It is the most sought after of all the salmon. Be certain to check with Alaska Department of Fish and Game before fishing and inquire about regulations pertaining to the species of fish that you intend to catch.